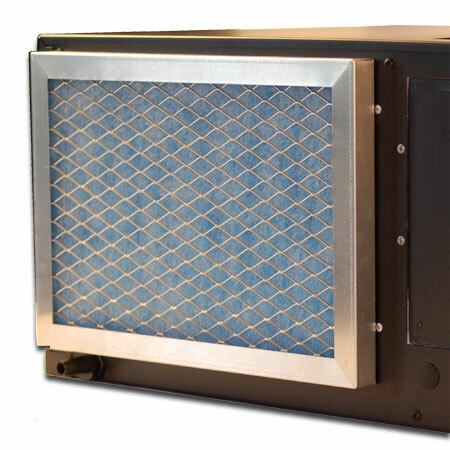 Le Cache offers an optional air filter and frame that magnetically attaches to the rear of the cooling unit. To install the air filter, simply place the magnetic strips against the rear of the cooling unit so that the intake coils are covered. To replace the air filter, pull the old filter out of the frame, and place the new filter into the frame with the white side against the filter screen. When properly placed, the blue side of the filter will be facing the cooling unit. 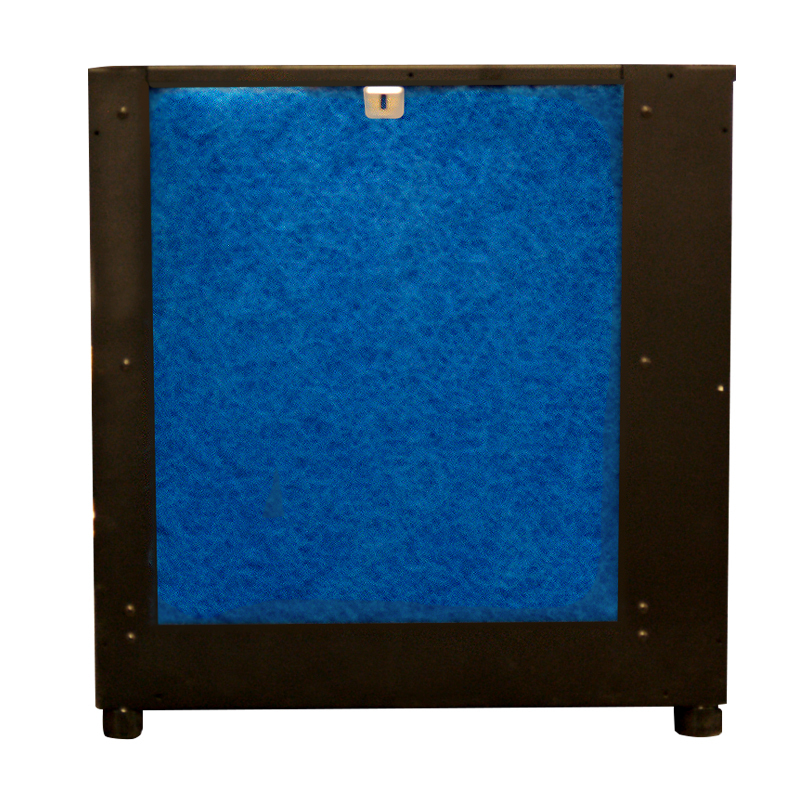 We offer an optional air filter and frame that magnetically attaches to the rear of the cooling unit. To replace the filter, remove the frame from the cooling unit (shown at right), and replace the fiberglass filter membrane every from 3 to 6 months depending on the conditions in your location. When replacing the filter, the blue fibers should face the cooling unit, and the white fibers should face away from the cooling unit. Please use genuine CellarPro replacement filters, which have density and resistance specs that are optimized to work with our cooling units. The condenser coils at the back of the cooling unit will collect dust, dirt and lint over time. If the condenser coils or filter become clogged, the cooling unit will not have proper airflow and its performance and longevity will be compromised. It is critically important to clean the reusable filter or replace the disposable filter every 3 to 6 months. The condenser filter slides out to the left or the right at the rear of the cooling unit. The condenser coils themselves also can be cleaned with a vacuum cleaner—ideally with a brush attachment to loosen dust caught between the fins. Reusable filters can be cleaned with warm soapy water. After each cleaning, we recommend using a tackifier (sold on our site) to maintain the filter's effectiveness. Disposable filters should be replaced with genuine CellarPro replacement filters, which have density and resistance specs that are optimized to work with our cooling units. The fiber orientation and density of the air filters are specified to work with the resistance curves of the air handler's centrifugal fans, and are designed to capture dust and particles while maximizing airflow and performance. Units are equipped with 2 filters, one for the evaporator coil and one for the condenser coil. Filters should be replaced every 3-6 months. Please use genuine CellarPro replacement filters, which have density and resistance specs that are optimized to work with our cooling units.